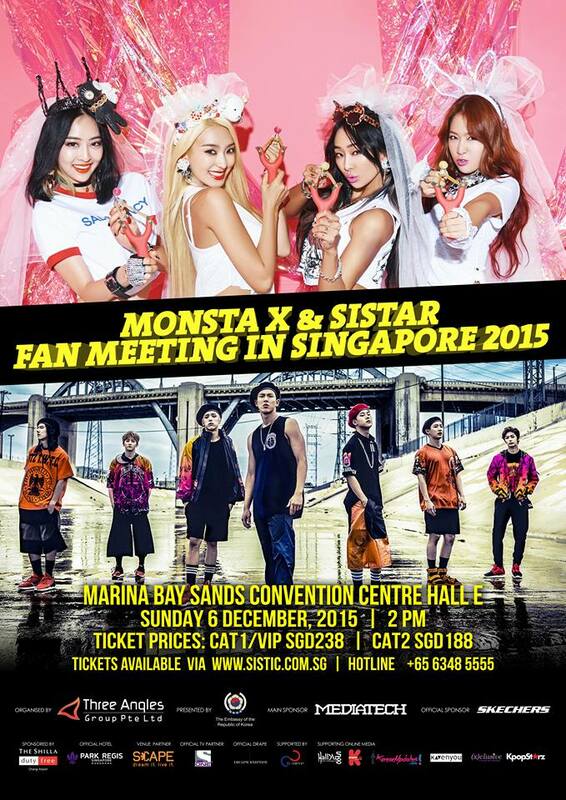 [UPCOMING] MONSTA X & SISTAR’s 1st Combined Fan Meeting on 6 December 2015! Three Angles Group proudly presents “MONSTA X & SISTAR FAN MEETING IN SINGAPORE 2015” on 6th December 2015 at Marina Bay Sands Convention Centre Hall E. This will be a one-of-a-kind combined fan meeting with two talented Starship Entertainment groups – MONSTA X and SISTAR. Even before debuting, members of MONSTA X have been garnering attention through collaboration singles. Kihyun and Jooheon were even involved in the OST for KBS drama ‘Orange Marmalade’. The group has since been actively participating in various other drama soundtracks including MBC drama ‘She Was Pretty’ and SBS drama ‘Mask’. In May, MONSTA X made their live debut stage on MNET’s M!Countdown with the title track ‘Trespass’. Their debut album swiftly climbed up to #1 spot on the Hanteo charts. Their success followed through their second mini-album ‘Rush’. The group is being nominated at the upcoming MNET Asian Music Awards 2015 under the “Best New Male Artist” category. SISTAR was recently in Singapore as ambassadors of popular footwear brand ‘Skechers’. The girl group consists of members Hyolyn, Bora, Soyou and Dasom. Debuted in 2010 with title track ’Push Push’, SISTAR has continued to impress with countless hit songs like ‘Loving U’, ‘Give It To Me’, ‘Touch My Body’ and ‘Shake It’. Not just topping music charts, they have also achieved plenty of awards and accolades, such as winning the title of “Best Female Group” at the MNET Asian Music Awards in 2012 and 2014 as well as clinching the Top 10 (Bonsang) at Melon Music Awards for 5 years straight! Members Bora and Dasom have also tried their hands at acting in SBS drama ‘Doctor Stranger’ and KBS drama ‘Love Rides The Song’ respectively. Fans can look forward to an amazing combined fan meeting between two phenomenal groups. Other than watching them perform their hit songs, there will also be opportunities for fans to interact with MONSTA X and SISTAR through specially prepared game segments. Do not miss this double treat!